Your day begins and ends in the bedroom, so keeping it organized will also keep you sane, which is why it’s the second room we’re tackling in our Home Hacks Series. Overflowing drawers, floors in disarray, and a cluttered bed will leave you feeling frazzled. But whether you’re working with a spacious room or a little nook, you can maximize your surroundings — and beautify them — with common sense and some clever storage tricks. It’s time to make over your messy space to ensure that you always rest easy with these 19 tips to organize your bedroom. 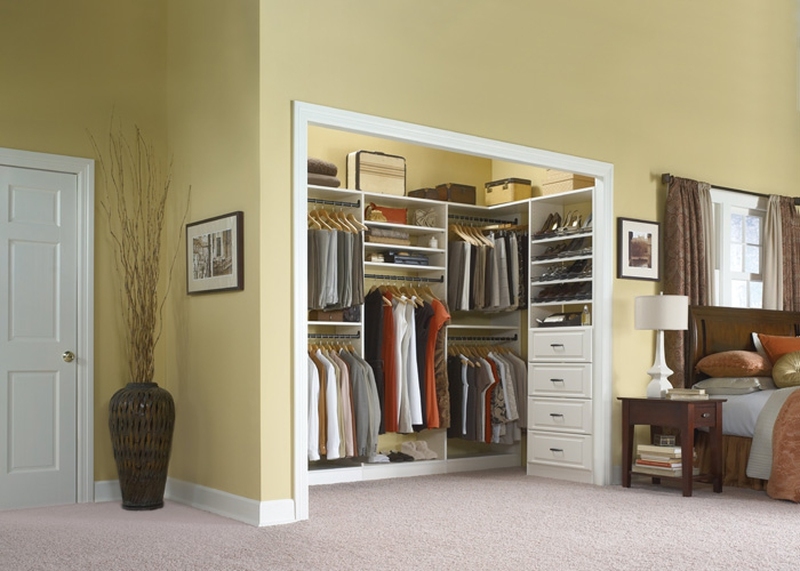 An organized closet is the heart of a well-kept bedroom. Follow these steps to optimize the aesthetics and functionality of this space. Do a Wardrobe Cleanse: Go through your clothes and get rid of anything that doesn’t fit or that you haven’t worn in the past few months. If it’s seasonal (like a sweater or shorts), and you haven’t worn it for the past season, it’s got to go. Be ruthless! Excess and clutter are organization’s nemeses. Fold Sweaters: Sweaters should be folded since hanging them can change their shape and cause them to snag. Stack them neatly on top of each other on shelves, and try to not make the piles too high. Movable cubbies can help. Hang with a Plan: Pick an organizational system for your clothing. Hang all the pants in one area, collared shirts in another, and dresses in another. You can further break down categories by length, occasion, or season. Be sure to invest in high quality hangers (no wires), and a variety of types including pant hangers and no-slip hangers. Color Code: Once it’s sorted by type, arrange everything in your closet by color. This may be tedious, but this is the easiest and quickest way to sort through your wardrobe and pick out what to wear. Shelf or Hang Bags: If possible, store bags on shelves. If you don’t have the floor space, you can buy a storage cubby for the wall or floor. You can also hang handbags from clothing hangers or use shower hooks. Keep Drawers Tidy: Fold everything in your clothing drawers neatly. Arranging shirts and pants horizontally instead of vertically makes them easier to sort through (check out this nifty video tutorial on how to fold in this manner). Use a drawer divider for smaller items like socks, lingerie, and belts. Design Shoe Storage to Fit Your Space: Customize your shoe storage to make the best use of your particular space. Shoes can be put on shelves, on the floor, or in cubbies. You can hang boots with pant hangers if you’re low in floor space. Custom shelving is the ultimate luxury in shoe storage, but a footwear cabinet is another ingenious solution. The area around your bed should be both tidy and inviting. Keep essentials visible and close at hand while maximizing hidden storage space. Store Items Under the Bed: The space under the bed is an ideal storage area that you don’t want to waste. You could use cubbies, baskets, or bags to stash bed linens and other non-essentials, but drawers are perhaps the quickest and easiest way to access this space and keep it tidy. Some beds come with built-in storage, or you could make your own from repurposed dresser drawers. Pick the Right Nightstand: Don’t let clutter pile up next to your bed. Depending on how much stuff you have, opt for shelves, drawers, or just a simple table. Don’t Forget Footboard Storage: Utilize the space at the foot of your bed for additional storage. Cubbies and baskets are a charming option. A chest or ottoman are chic and ideal for storing blankets, linens, and out-of-season wardrobe items. All those little details, from wall shelves to jewelry storage, make a huge impact on the efficiency and attractiveness of your space. Display Organized Jewelry: Depending on the contents of your jewelry collection, there are many great DIY jewelry displays to chose from. You could make a prettily patterned shelf for hanging necklaces and placing rings in elegant dishes. Wire mesh allows you to easily create earrings organizers for both dangles and studs. Try stacking bangles on a bracelet tower or cone, or hanging them horizontally from rods. Keep a Clean Vanity: You can make your own bedroom vanity from a vintage desk, or even an armoire. Keep it organized using everyday items like cake stands for displaying perfume, trays for makeup, and small dishes for other accessories. Fit in a Desk: If you need work space in your bedroom, your nightstand can do double duty as a desk. Look for a minimalist model and pair it with a small chair. Maximize Wall Space: High-up bookshelves are perfect for storing beloved past reads and other items you don’t need super easy access to. Wall cubbies are a modern way to display knick knacks. Minimize Laundry Space: Save space with a hanging laundry hamper that fits discreetly over the back of a door. It’s easy to make your own with fabric and an embroidery hoop. Use a Coat Rack for Extra Hanging: If you need additional hanging space, or just want to keep jackets and heavier winter wear in the bedroom, an industrial coat rack is a chic and practical piece of bedroom decor. Invest in Storage Ottomans: These are beautiful and practical pieces of furniture, a great way to stash those bedroom extras — like the pair of slippers you always leave lying around. Decorate with Hanging Hooks: You can use hooks for everything from hats to scarves and bags, and even small framed artworks. Some also include shelf space for displaying pictures, stuffed animals, or other favorite items. Server responsed at: 04/23/2019 6:19 a.m.